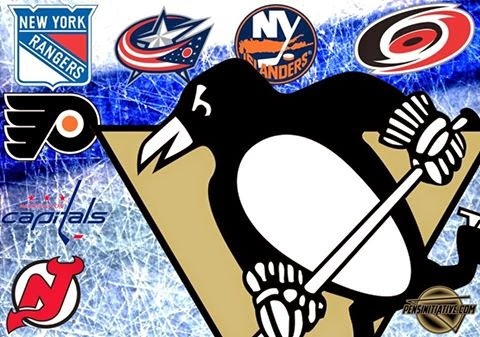 After another disappointing postseason, an offseason full of transition and a summer packed with criticism, the Pittsburgh Penguins will soon enter the 2014-'15 campaign looking to defend their Metropolitan crown. Though all the new faces may lead to some growing pains, the Pens still possess enough tools to conquer the division for a second straight year. Will they enjoy another double-digit cushion in the standings throughout the season? Probably not. But, below, we present five reasons why Pittsburgh should, once again, rise to the top of the Metro. Last year, Crosby practically dragged a decimated Penguins team along with him to a division title. After his 104 points made a mockery of the scoring race (Ryan Getzlaf finished second with 87), the Pittsburgh captain cruised to his second Hart Trophy. But after a personally subpar postseason and another early playoff exit, Sid should find plenty of motivation to come back with a vengeance in 2014-'15. It's not difficult to argue that the Pens find themselves headed in the right direction. While there's still some uncertainty regarding the squad's scoring wingers, Pittsburgh should enjoy more depth up front this year, a luxury that will take some pressure off Crosby's shoulders and lighten his workload. And, if he doesn't have to play as many "tough" minutes this season, Sid could find himself in store for a monster campaign as he steers the Penguins towards another Metropolitan crown. Is there another team in the NHL that can match the Pens' one-two punch at the center position? One could probably make an argument for a team or two but, without question, none of them reside in the Metropolitan Division. Because, when Crosby comes off the ice, it's usually Evgeni Malkin that jumps over the boards. Talk about a matchup nightmare. Which Hart Trophy winner are opponents supposed to focus on? Which Art Ross Trophy recipient do you try to shut down? Regardless of the decision, opponents often find themselves in for a long night when squaring off against the duo, something that should continue in the coming season. Behind two of the most talented players in the world, Brandon Sutter provides the Pens with a solid pivot on the third line. No, he's not Jordan Staal and, no, he hasn't put up eye-popping numbers since coming over from Carolina. But he does provide sound, two-way play behind two superstar centers. What's more, he'll be looking to build off a strong playoff performance and, given the fact he'll likely find himself flanked by more talented wingers this year, a spike in production would come as no surprise. Meanwhile, Marcel Goc brings great value to the fourth line. Pens fans didn't get to see much of the deadline acquisition before a nasty injury slowed him down last year but he'll provide a significant upgrade in depth. He'll win draws, play sound defensively, contribute on the penalty kill and likely chip in more offense than anyone residing in last year's bottom-six not named Brandon Sutter. If it was Crosby that carried the Pens on his back last year, then it was Fleury's steady play in net that helped spot the captain en route to Pittsburgh's 109-point season. No, his numbers don't always sparkle. But, ultimately, the guy finds ways to win. Whether it's coming up big in a shootout or making a save late in the third period, Fleury more often than not provides Pittsburgh with a chance to win. As a result, the Penguins can annually count on "The Flower" to do his part and backstop the squad to the top of the standings, to collect 35+ win seasons the way Jay Leno collects cars. In fact, you have to go back to an injury plagued 2007-'08 campaign to find a (non-lockout) year in which the veteran failed to notch at least 35 wins. Since then, Fleury's proven automatic. It's that kind of consistency that the Penguins can count on to help them charge to the top of the standings. And, with Fleury entering the final year of his contract without an extension and his reported desire to stay in Pittsburgh, you can bet he'll have plenty of motivation to deliver again in the 2014-'15 season. Ask anyone who follows the Penguins about last year's bottom-six and responses will likely range from "bad" to "a complete and total train wreck". That's because, outside of Brandon Sutter, nobody registered more than five tallies or 17 points. On top of that, the possession numbers caused the advanced stats crowd to cringe as the third and fourth line struggled on a nightly basis. So, when Jim Rutherford took over this summer, he set out to strengthen the club's depth. In the end, he did a pretty good job. With the exception of retaining Sutter and Goc, he let almost everyone else in the unit walk via free agency. Then, he brought in Steve Downie, Blake Comeau and Nick Spaling (in addition to inviting Daniel Carcillo to training camp) in an effort to bolster the previously inept group. Now, the third and fourth lines are filled with versatility, with players capable of playing a solid, two-way game. And, now, the bottom-six will actually prove difficult to play against; it will take pressure off Crosby and Malkin, allowing the stars to lighten their load when it comes to eating up all the tough minutes. Equally important, though, the bottom-six should actually contribute this year. In fact, you can probably expect three or four double-digit goal scorers from the "depth guys" in 2014-'15. On top of that, they'll bring physicality, kill penalties and, simply put, help transform the Penguins into a more balanced team. Last year, a depleted Pittsburgh squad cruised to the initial Metropolitan crown, mostly dominating the division from wire to wire. In the end, they outpaced their nearest rival by an astounding 13 points. Of course, that's not likely to happen again year. A new coach, new system, and a plethora of roster turnover may all combine to prevent the Pens from replicating an early season stranglehold on the Metro but that doesn't mean the Penguins can't prevail in the end. After all, Crosby and Malkin will still anchor a potent attack, the team will boast an impressive defensive core, the goaltenders should provide solid play in net and Jim Rutherford significantly beefed up the squad's depth. So, with all that in mind, who's going to overtake them? Admittedly, an emerging Columbus squad may prove a threat (assuming they finally come to terms with Ryan Johansen) but, outside of the Islanders, who else significantly upgraded their roster this summer? The Capitals usurped Brooks Orpik and Matt Niskanen from Pittsburgh, providing new coach Barry Trotz with some tools to help strengthen Washington's defensive play. But the team also lost Mikhail Grabovski, creating a potential hole at the center position that has yet to truly be addressed. On the surface, it may not seem like a huge loss but it could cause problems as the season moves along. Philadelphia wasn't able to address many needs this summer given the club's salary cap woes. Worse yet, the loss of Kimmo Timonen to a frightening bout with blood clots leaves a suspect blue line in further disarray. After capturing the Prince of Wales Trophy, the Rangers lost a significant amount of depth up front this summer. Their only significant addition came as a result of signing the aging Dan Boyle. For their part, the Devils added Mike Cammalleri and Martin Havlat in an effort to jumpstart the club's anemic offense but it's still difficult to imagine New Jersey scoring enough to threaten for a division title. And, finally, Carolina failed to improve much on a roster that finished seventh in the Metro last season. Obviously, the division won't be won or lost as a result of offseason moves or a lack thereof. But when you add it all up, it's hard to imagine someone wrestling the Metro away from the Penguins when looking ahead to the 2014-'15 campaign.